Lunch in the library? Kids eating at the computers? Students hanging out while I’m teaching? Of course! Thinking back on all the big and small changes I made as the new teacher librarian at my middle school three years ago, allowing students to eat their lunches in the library may not sound significant, but it was by far one of the best. Admittedly, as a brand new school librarian I was willing to try about anything to bring kids into the library. As a student, I hated being stuck in the cafeteria for lunch, so I thought a change of location might be enticing for some kids. I informally polled some students and their positive responses were pretty unanimous. I could easily imagine the huge payoffs from students having extra time in the library, like more opportunities for positive interactions and for library staff to form relationships with our kids. Not to mention, more opportunities for students to look at displays, make suggestions, check out books, and just enjoy the library space. And, best of all, this wouldn’t cost anything except for the effort to promote it to students, teachers, and administration. Convincing my administrator and the kids that library lunches were a great idea was never an issue. I gave my principal a quick pitch of the idea, and she agreed it was worth trying. The kids were almost literally beating down the doors to get their passes to eat in the library each day. The teachers on the other hand, they were the tough ones. Their concerns about student messes and lack of responsibility were part of why I was pushing for lunch in the library. I work in a high-needs school where students always seem to be told no and reminded of all the things they can’t do. Eating lunch outside of the cafeteria was something they definitely could do. Students can sit together and talk quietly, even when I’m teaching a class. Students can clean up after themselves. Students can eat at the computers (just like a lot of adults do). 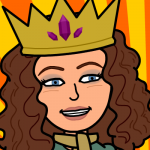 Students can meet expectations, and they respond to being trusted and given responsibilities. 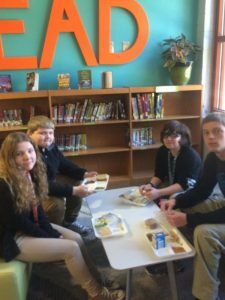 Lunch in the library has been a successful way to increase library usage and circulation, but more importantly, it’s building community and bringing students together. Yes, there are regulars, but there’s always a different mix of students each day. There’s something for everyone. 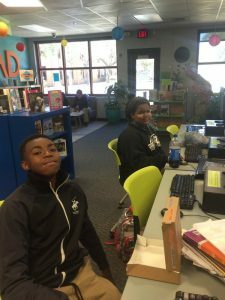 Students come to read, chat, play games, work on projects, avoid conflicts, find books, talk to the staff, make up work, tutor, and more. Library lunches have created a safe place for students. Of course our library can’t accommodate all 965 of our students for lunch every day. We’ve put a few things in place to manage the day-to-day practicalities. Passes are given out in the morning in the library during homeroom time. 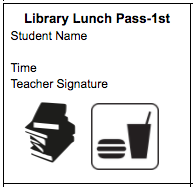 We give out a certain number of passes for each lunch period based on other activities in the library. If I’m teaching or a class is using the library, there are fewer passes distributed. Students need to have their school ID to get a pass to support school-wide expectations. With six different lunch periods each day, the timers I set on my iPad are invaluable to make sure that students have enough time to clean up and get back to class on time, even when there are other activities happening in the library. Giving students more opportunities and more reasons to come to the library is never a bad idea. Allowing students to eat lunch (or breakfast or snacks) or whatever works for your school and your schedule is definitely worth trying. What experiences have others had with lunch in the library? I am the Library and Media Services Specialist for Charleston County School District in South Carolina. Previously, I was the teacher librarian at Northwoods Middle School in North Charleston, South Carolina. When I’m not working with our district’s teacher librarians and advocating for our school libraries, I like to read on the beach, play with my puppies, and try new restaurants with my husband. We are a PK-3 campus and we do eat in the library by invitation on Fridays. We are a humming place and don’t have any space for students to sit down out of the way Mon-Thurs and eat in peace, but on Friday we have a block of time around lunch. We invite students – as you said, a certain number – to bring their lunch and eat with us. We try to make it special by inviting them to do the things they don’t normally have time to do – talk quietly, read a magazine or other “fun” material, work puzzles, play games. Amazing enough, a great majority of students just want to sit with “their” librarian (there are 2 of us) and talk and ask questions. I feel privileged to be able to form those relationships. How do you deal with food allergies, like severe reactions to peanuts? It would be difficult to say the media center is a safe place for those students, especially with food at the computers. I love the idea though. We have lunch and Minecraft in the library everyday! If students have severe allergies like that, then those products aren’t even allowed on campus. We have one kid who is deathly allergic to platex. None is allowed on campus, even if it isn’t in his hallway. We have another who is allergic, albeit not deathly, to peanuts. Those products aren’t allowed as well. Yes, some parents have a problem with that but if it were their child, I’m sure they would want the school looking out for their life. Betty, I love the idea of lunch by invitation and giving students opportunities to eat with the librarian! Usually, I have classes during the lunch periods, but I think doing the invites every few weeks would be a great way to mix things up and reach out to different students. Karen, food allergies are big consideration. We already are a peanut free school, so that was a non-issue. I do check with our school nurse to make sure we don’t have any other severe food allergies. We’ve been lucky, but I wouldn’t have a problem making the library a safe place where certain foods couldn’t be eaten during lunches. I have tried this with high schoolers and sometimes end up spending the better part of the hour afterwards cleaning up messes. Any tips? Angela- That’s awesome! What a great idea! I’m sure the kids love the lunch and the time to work on Minecraft! Stefanie– We’ve had some messy eaters, but they’re usually pretty good. If students leaves a mess, they don’t get passes the next time they come in– and we explain why. Those kids don’t continue to leave messes. We always have Clorox wipes and paper towels available for the students to grab as needed. When the alarm goes off for one lunch group to leave, we make an announcement that lunch is over and that they need to clean up their areas. We also have a big trash can right outside of the library doors for the kids to throw away their trash. Our kids know that it is a privilege and that we trust them to do the right thing. They rarely disappoint us =) Good luck! I love this idea! I just suggested that we try it in the new year at our school!